Soft Machine Polishing Pad for Flawless Finishing. Waxes, glazes and sealants require a soft machine polishing pad with no cutting ability, to ensure the paint surface is burnished to a high shine. HEX-LOGIC Black Finishing Pad is made from ultra fine, soft foam and the laser-cut honeycomb pattern ensures products are spread evenly and thinly over the panel, to guarantee a perfect finish every time. 'HEX-LOGIC' refers to the hexagonal shapes precision laser cut into the surface of the pad face. The depth of the grooves forming the hexagonal patterns alters depending on the function of the pad, with cutting pads having deeper grooves. The deeper the groove, the more powerful the cutting action. 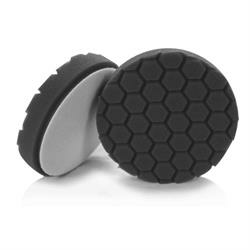 Combined with durable Acu-Pore technology, HEX-LOGIC pads allow product and air to circulate through the pad to deliver the best results possible.